“The View From 85” is a fictional memoir depicting what it’s like to be really old, with its attendant aches and pains, disabilities, surgeries and the like and possibly a few mitigating pleasures. Martin’s latest stories are about senior citizens but his stories as a whole concern mostly ordinary people dealing with life’s common issues: finding a significant other, getting a job, then marriage, family, choices to be and fate. He also has speculative stories about a council on a super-intelligent planet that meets annually to debate what to do about that pesky planet Earth: a farm boy in olden times who rescues a princess with the aid of Bob, his family dragon: a young man who falls in love with Count Dracula’s daughter: and Uncle Pringle, who has an uncanny knack of solving people’s problems in between counseling world figures. 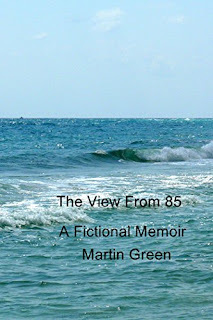 “The View From 85” is available at barnesandnoble.com as a Nook book for 99 cents. Another fictional memoir, “One Year in Retirement (and 25 Short Stories),” is available on Amazon as a Kindle book for $2.99. A novelette, “A Life: Phase One,” is available as an e-book on kobo for $1.99. Martin also has issued five volumes of “Collected Short Stories.” Volume I and Volume V can be had at Amazon as Kindle books and Volumes II , III and IV at Barnes and Noble as Nook books.